You are currently browsing the tag archive for the ‘daily post’ tag. 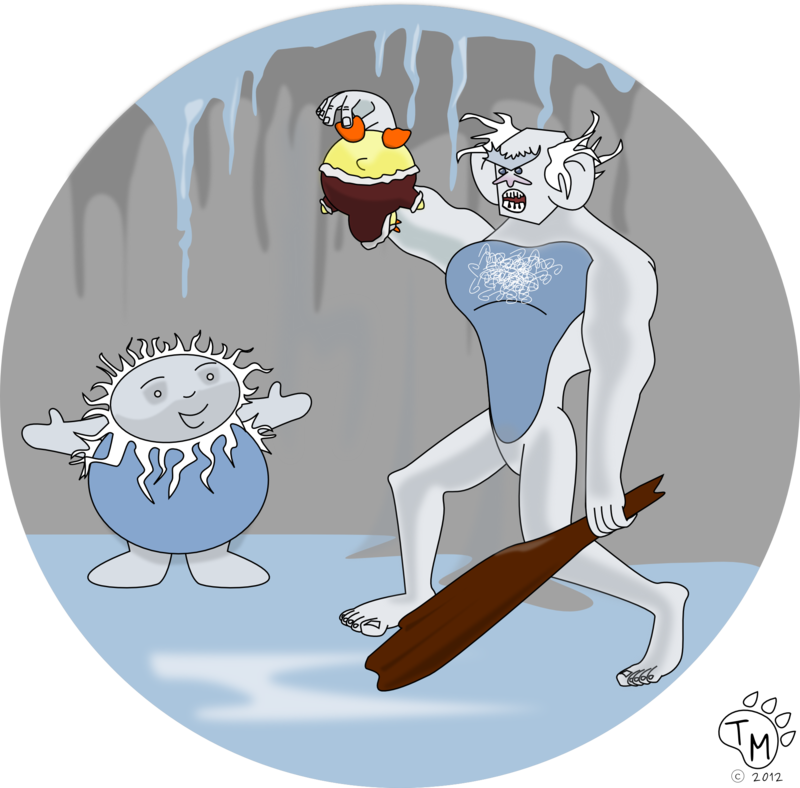 The Ducky Express was hopelessly trapped in a pile of snow, but Ducky needed to get the blankets and supplies to the animals of the North East. To make matters worse, Ducky was starting to get really cold! Using the dogsled, Ducky and Pembleton were able to load all of the supplies and carry them to the donation center where they were distributed to hundreds of animals. Last week Mrs. Cottontail received a letter from the North East Animal Society requesting help from animals all around the United States. This winter has been very chilly and with many animals losing their homes during hurricane Sandy, they need extra help to stay warm. Mrs. Cottontail had the little guys make signs and go door to door asking for blankets and sweaters for animals of all sizes. They received so many donations! Especially from the snow birds in Florida who didn’t need the blankets they brought with them in the fall. They received so many donations, they weren’t sure how to deliver them. Pembleton had already headed to up north to assemble a group of volunteers to help distribute the donations, so Ducky had to come up with a plan to deliver all the goods. Since Pembleton wasn’t there to tell Ducky “No”, Ducky got his train out of storage, and volunteered to take them up himself on the Ducky Express! He was on his way and this time he was going to follow the rules of the rails and not get in trouble (or so he hoped). 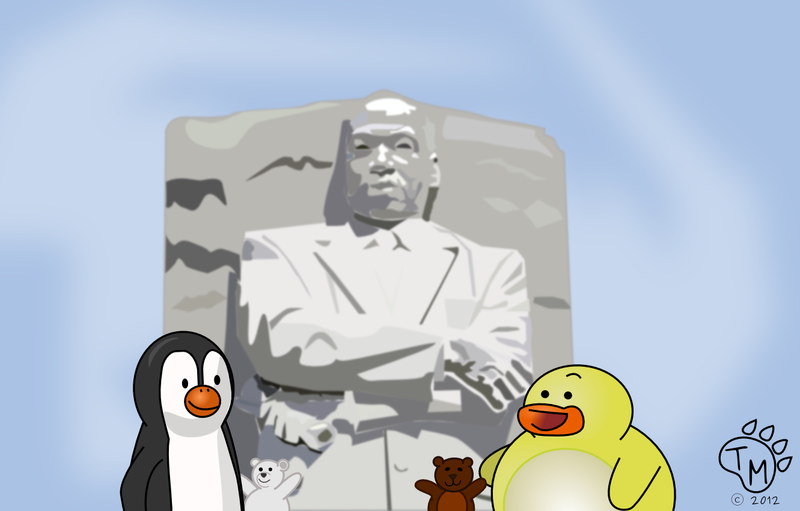 Ducky and Pembleton took Ted and Blizzard to visit the Martin Luther King Jr. Memorial in honor of Martin Luther King Jr. Day. When Ted asked Ducky why we celebrate Dr. King’s Birthday, Ducky explained that Dr. King was the first man with X-ray vision and that he had super strength. Today Pembleton had to make a tough decision. He went into the kitchen for a cookie and found that there was only one left. He held the cookie in his wings and thought about whether he should eat it by himself or share it with Ducky. Suddenly a chubby angel and a chubby devil appeared on his shoulders. 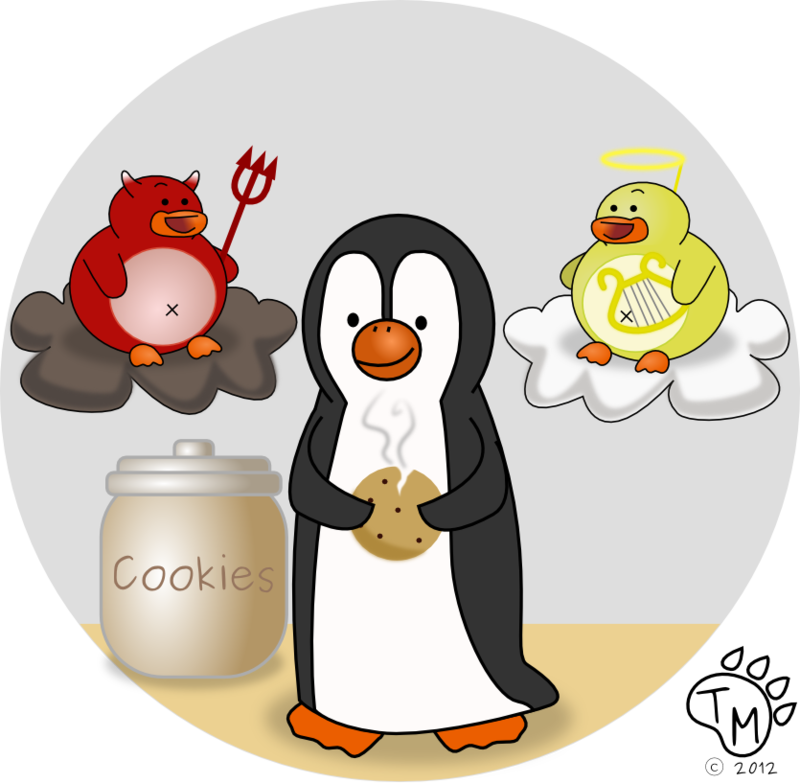 The devil said, “Quick, Eat the cookie before anyone sees you!”, but the angel said, “No! Share the cookie with Ducky. Wouldn’t he do the same for you?” The devil said, “No he wouldn’t!”. Pembleton looked at the angel, then the devil, and then back at the cookie. Then he went and shared the cookie with Ted and Blizzard. 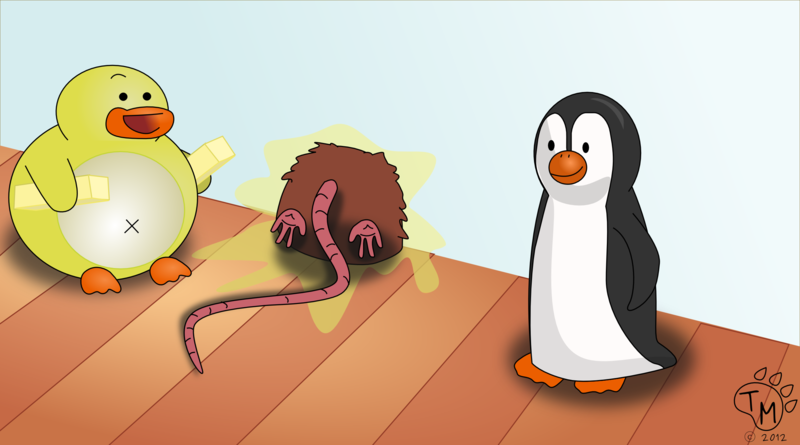 Ducky and Pembleton were called in to rescue a rat that had gotten stuck in the wall after feasting on too many holiday goodies. When Ducky and Pembleton got to the house they found two legs and a rat tail sticking out of the wall. Ducky went and got the butter to lubricate the rat. Several sticks of butter later, they managed to pull the rat out of the hole by his tail. They all agreed that the rat needed to find a home with a larger front door, so Ducky arranged for the rat to stay with a family of Opossums until he could find a new place. Basketball is Pembleton’s favorite sport. So Pembleton was super excited when Mrs. Cottontail told her class about the annual basketball fundraiser. Both Ducky and Pembleton signed up to play, and the whole animal community showed up to the game. 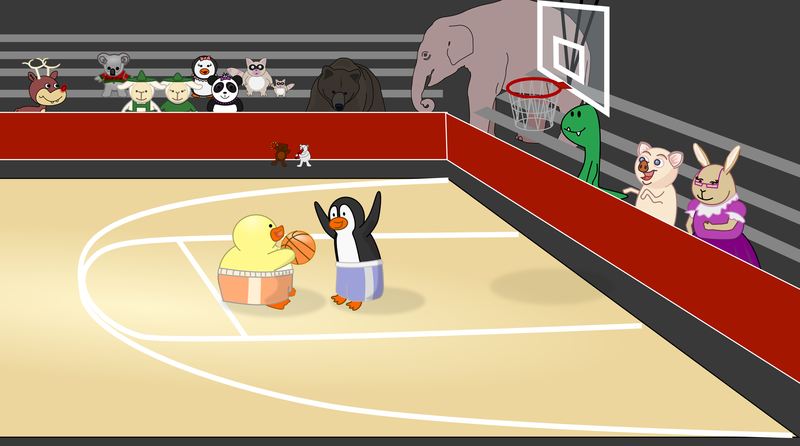 Ted and Blizzard cheered from the sidelines and Amanda Panda kept yelling for Ducky to slam dunk the ball. During the game Pembleton scored one basket. Ducky had a little trouble aiming the ball and never managed to score. When the buzzer sounded Ducky tossed the ball into the air over the basket and into the audience. The crowd cheered! They rushed down to the court and carried both Ducky and Pembleton out of the gymnasium on their shoulders. The fundraiser earned lots of money for the local humane society, and Mrs. Cottontail said she was proud of them for playing so well. Ducky and the gang finished their East coast road trip yesterday as they drove through Washington D.C., Maryland, Delaware, New Jersey, and finally to New York! This was their least favorite part of the trip. They were tired and grumpy. While Pembleton, Blizzard and Ted were comfortable with the the cold temperature, Ducky was not! But now that they are in New York and have had some rest, they are ready for more adventures! Are you aware that we are in Delaware? WHAT? Where is the real sign? I’m hungry! I want a bite of the Big Apple. This weekend Ducky and the gang are decorating the house for Christmas. They are ready to string lights, hang stocking, and of course put all the bells and whistles on the tree. Every year, they get a special Christmas tree from Woody the beaver in the animal forest. This year’s tree is by far the most beautiful tree Ducky has ever seen. He couldn’t wait to tie the tree to Ducky Ducky Bang Bang and bring it home to Pembleton and the rest of the gang. At school Amanda Panda invited Pembleton and Ducky to a fancy tea party at her house. She also told them to dress nice. Ducky and Pembleton had other plans, but didn’t know how to tell Amanda no. “Awesome! Now lets go before we get in trouble. You know Amanda doesn’t like us to be late.” Ducky said as he grabbed his war hammer and was out the door. When they got to the party, Amanda Panda and Penelope the Penguin, were setting up the tea party with tea and cookies on the table. Then with one look at the two boys, Amanda Panda began to fill with anger. “Do you know how hard it is to get authentic Captain American and Thor costumes? These are collectables!” Pembleton replied. After enjoying her cookie Amanda Panda cooled off, but demanded Ducky not put his war hammer on the table. Yesterday after school, Ducky and the gang were enjoying a nice afternoon inside. Pembleton was reading a science book, while Ducky was playing with his toy truck. Ted and Blizzard were getting restless and wanted to go outside. They went to the window to make sure it wasn’t raining, because it was so overcast. When they looked out they couldn’t believe what they saw, so they had to get a closer look. So close their noses were pressed against the cold glass. “It’s snowing Ducky, I can’t believe it,” cried Ted. 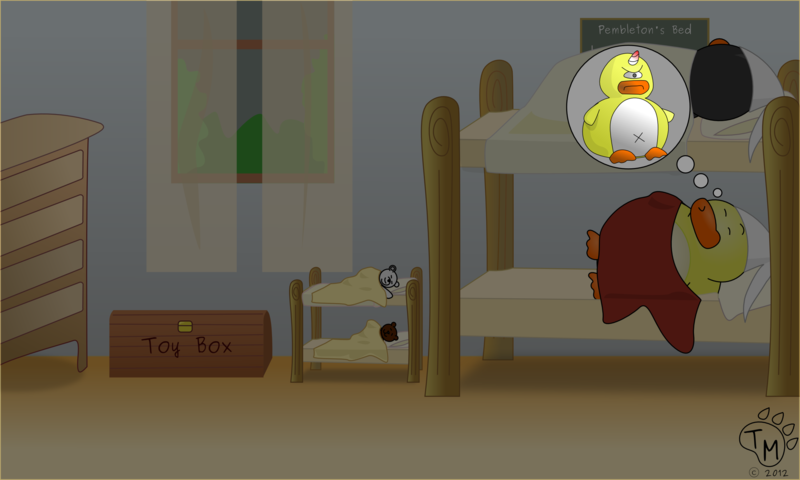 Pembleton put away his book and Ducky slid his truck under his bed, before heading to the window to investigate for themselves. Before they knew it, Blizzard had gotten their scarves out of the closet and they were headed outside to enjoy the first day of snow. Last night, Ducky had a scary dream. He dreamed that he was an angry cyclops. Everyone one was scared of him, even Ted. Cyclops Ducky was so sad he went to the kitchen to get a gingerbread cookie, and even his cookie ran away! Ducky Cyclops became even more angry because he was sad. He let out a loud bellow and began to cry. Ducky was so thankful his brother was there to wake him up. At this point Ted and Blizzard were also awake and wanted to know what was wrong. Ducky told them all about his dream and at the end, Ted gave him a hug. Ducky felt much better after telling him about his dreams and being reassured he was not a cyclops. As he drifted back to sleep he wondered, if there were still any gingerbread cookies in the kitchen.